The 2019 Budget reflects an increase in property taxes by 3 mills from 18.25 to 21.25 mils. The fund balance for the general fund, continues to reduce due to increases in unfunded mandates, cost of equipment, materials and operational items. Additionally, 1.5 of the mileage increases will be dedicated to debt service related to road improvement projects. Proposed paving projects for 2019 include Meadow Lane, Meadow Circle, Rickert’s Road (Hilltown side of 313) Mill Street and Parkside Drive. .
A home owner assessed at the average assessment value of 26,262, will pay $558.06 per year in real estate property taxes, or $1.53 per day for Borough services. Of the total 21.25 mills, 16 mills are designated for General Fund purposes and equals approximately $299,937; 3.75 mills are designated for street improvement debt service and equals approximately $70,298; and the remaining 1.5 mills are allocated to the Street Improvement Fund and generate approximately $28,119 in revenue annually. Due to the cost of the projected Sewer Capital Projects and Debt Service over the next five years, the Finance Committee proposed a $40.00 annual increase to the current Sewer Fee $620.00. An increase of $10.00 per quarter. The increase in the Sewer Rate will be dedicated to the Sewer Fund. The proposed capital improvements are associated with the PA DEP’s Consent Order and Agreement to reduce inflows and infiltration into the sewer system. The Borough is extending their Consent Order and Agreement (CO&A) with PADEP for another five (5) years. The current agreement expired December 31, 2018. The extension outlines the proposed capital projects to be completed over the next five years. Projects include relining of the lagoon at the sewer plant, improvements to the Kern Drive Interceptor, Twin Oaks Pump Station and Sewer Treatment Plant. The Adopted Budget DOES NOT reflect an increase in water fees. The base rate fee for each unit of water established in 2013 continues to provide $79,644 annually. In addition to the base rate, the gallon usage fee remains at $3.70 per 1,000 gallons of water used. The finance committee is proposing to borrow for some capital water projects, like the repainting of the water tower, while utilizing the existing reserves for other capital water projects. Allocating resources wisely for the health, safety, and welfare of the community is an important step in maintaining accustomed service levels that will enhance the quality of life currently enjoyed by our residents. The Adopted 2019 Budget provides the necessary resources for the Borough organization to achieve the goals and priorities established by Borough Council. 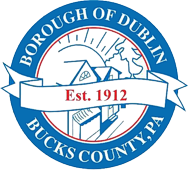 It maintains accustomed service levels and represents an accurate estimate in dollars of the Borough’s commitment to deliver quality municipal services to the Dublin Borough community. This budget document is presented here for your consideration and the Administration will be pleased to address any questions on the document. Act 32 of 2008 amended the Local Tax Enabling Act, which mandated countywide collection of Earned Income Taxes. Starting January 1, 2010, Dublin Borough changed its Earned Income Tax Collector from Berkheimer Tax Administrator to Keystone Collection Group. All Earned Income Tax collected should be remitted to Keystone Collection Group. Berkheimer Associates is responsible for 2010 and previous years. For Information about 2016 and General Local Earned Income Tax, Click here. All individuals who are employed in Dublin Borough are required to pay an annual tax of no more than $52.00 ($1.00 per week). Employees are exempt from paying the Local Services Tax in any calendar year in which they earn less than $12,000. Keystone Collection Group is responsible for collecting the Local Service Tax. The County and Borough Real Estate tax bills are sent yearly to property owners on on/or about March 1st of every year. The property taxes for a property within the Borough of Dublin is subject to a total tax rate of 21.25 mills in which 16.00 mills for General purpose and 5.25 mills for Street Improvement Fund. 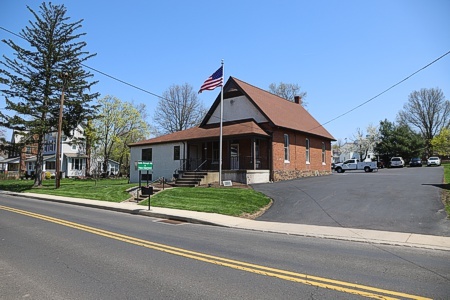 The Pennridge School District Real Estate bills are sent yearly to the property owner on/or about July 1st of every year. The Property Tax/Rent Rebate program benefits eligible Pennsylvanians age 65 and older; widows and widowers age 50 and older; and people with disabilities age 18 and older. The income limit is $35,000 a year for homeowners and $15,000 annually for renters, and half of Social Security income is excluded. The maximum standard rebate is $650, but supplemental rebates for qualifying homeowners can boost rebates to $975. Under a homestead or farmstead property tax exclusion, the assessed value of each homestead or farmstead is reduced by the amount of the exclusion before the property tax is computed. If your application is approved and designated state revenues are available, your property tax relief will appear as a tax credit on the property tax bill that you receive from the school district in which you live.